The biggest moment in modern Jaguar history wasn't the sale of the company from Ford to Tata, but the launch of the Jaguar XF. With it, Jaguar proved they were committed to being a better carmaker. 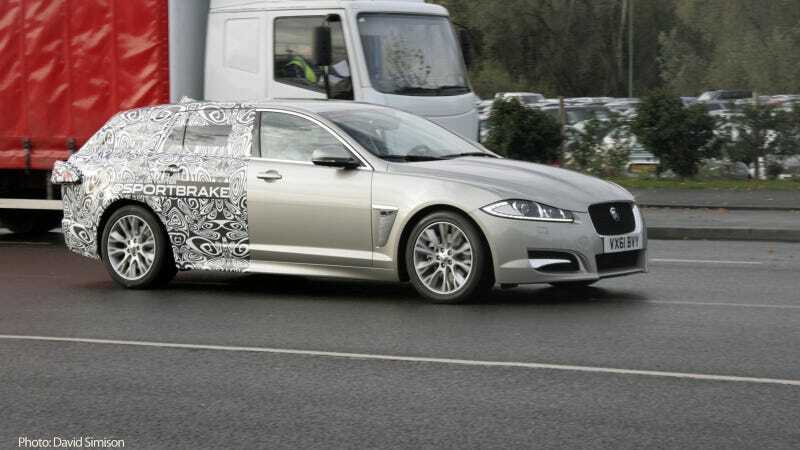 And now with these automaker-released "spy photos" of the Jaguar XF Sportbrake — neo-Britspeak for wagon — they also proved they've been reading our diary. A love affair with the current Jaguar XF begins with its sedan-in-name-only design and coupe-esque greenhouse that manages to look as sleek as a sports car while retaining the roominess of a mid-size luxury sedan. Performance-wise it's stable and comfortable in every trim, but downright naughty in XF Supercharged and XFR form. An aristocratic kind of deviousness that wraps dirty thoughts in gorgeous leather, wood and metal trim. Think Marquis de Sade. Jaguar even retained its infamous strangeness with the peculiar dial-a-gear transmission and touch-sensitive glove compartment. Sure, when they break it'll be an electronic nightmare, but it's the kind risk the car makes you want to take. None of this should change with the Jaguar XF Sportbrake, a car I didn't reaize I wanted until I found out it existed. There's a renaissance of sorts coming for the wagon and, if the CTS-V is the Giotto, maybe the XF Sportbrake can be the Caravaggio. Lest you think someone is fooling with you, a supposedly Jaguar-sponsored Twitter account is handing out the photos to anyone who asks (making it laughable that some outlets have watermarked them). The photos implore you to follow @Sportbrake on Twitter. We encourage you to do so and then continue to harass them until they build an XFR version.